Dad & Dave’s Brewing is a family owned and operated business in the heart of Brookvale, known for sensational tasting craft beers. What started as a means to save money while Dave was scraping by on apprenticeship chef wages, became a burgeoning business as beer lover Dave teamed up with his Dad, John, to create their very own brew. They experimented with traditional ingredients of malt, hops, water and yeast, combined with innovative ingredients and brewing techniques to create their signature #1 Pale Ale. And that was just the start. The duo now has four beers in the Dad & Dave’s core range with the plan to offer a series of speciality beers on sale, alongside their four main beers, from the brewery in Chard Road, Brookvale. 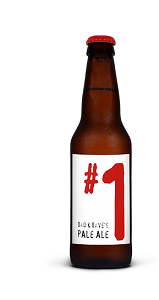 Dad & Dave’s #1 Pale Ale is brewed with 100% Australian Pale malt and Pacific Gem hops from New Zealand. The malt and hops balance the malt sweetness and the tropical fruit flavour while maintaining the sessional quality typical of Australian Pale Ales. Perfect for any occasion! Dad & Dave’s #2 Belgian IPA is a delicious mashup between two great styles of beer. Instead of using 100% malt, they use Belgian candi sugar to achieve a lighter mouthfeel without compromising flavour. With the use of Australian Galaxy hops and Belgian Saison yeast, they create subtle spice and savoury flavours with an aroma of a classic IPA. ad’s #3 Pils is crafted in the traditional style. Brewed with classic Pilsner malt, Saaz hops and Czech lager yeast, the beer has a rich malt flavour with a crisp finish. A truly uplifting craft beer experience! it is deliciously full of flavour. This beer satisfies without going over the top.